The most remarkable aspect of the UK’s negotiation to leave the EU is the way in which the British government has allowed the Irish government to control the narrative around the Good Friday Agreement unchallenged. Dublin’s partial reading is a major obstacle to a compromise on the backstop and also contains associated risks for the future of the peace process in Northern Ireland. There are many heroes of the peace process, from Belfast to Dublin to London. The then Irish Taoiseach Bertie Ahern in particular deserves great credit for the way in which, at the very last minute, he softened the Irish negotiating position in order to get a deal. But also undoubtedly the Good Friday Agreement represented a triumph of British statecraft, which held the line against occasional Irish efforts to push the United Kingdom towards positions which would be unacceptable to the majority community in Northern Ireland. This permitted a historic compromise between unionism and nationalism in Ireland. Since then, it has been the uncomplaining British taxpayer which has met the considerable bills for the maintenance of Northern Ireland. Every single year, successive UK governments have expended considerable energy on the objective of maintaining the Good Friday Agreement. As it is, the Withdrawal Agreement specifies that in the event of social and economic disorder in Northern Ireland, the UK has a unilateral right to suspend any aspect of the backstop which has played a role in generating this disorder. This is a useful safety valve. But it also reveals how the UK has more skin in the game than anyone, including the Irish government, and more to lose if anything were to go radically wrong. The EU and the government of the Republic of Ireland, in a largely uncontested narrative, has managed to turn Northern Ireland into the weakest link in Britain’s negotiating position over Brexit. However, even now, the opportunity remains for Britain to defend the Good Friday Agreement and transform the terms of debate around the Withdrawal Agreement. This is the obvious course for the UK government to take. The Good Friday Agreement contains a number of precise protocols for institutional development within it. It asserts the control of the Northern Ireland Assembly — ‘specific endorsement’ is the phrase — over the pace and character of North-South co-operation. At the very top of the list of co-operation, it places agriculture and animal health. This means that if there was a proposal to expand the relationship in such areas of North-South cooperation, the consent of Northern Ireland’s elected representatives must first be obtained. Policy Exchange previously examined this problem in its report, The Irish Border and the Principle of Consent. As a Remain voter, I have no difficulty in acknowledging the de-stabilising effects of Brexit on Irish politics and the sense, recently articulated by Mark Durkan, former leader of the SDLP, that it is a top-down imposition on unwilling communities, both North and South. But another ‘top-down’ intervention will not open up a new era of harmonious relations in Ireland. The Withdrawal Agreement, alas, places key areas of such co-operation entirely under the operation of a new EU-led regime – a regime which begins from day one of the implementation of the backstop. UK government reassurances about the future miss the point. The damage to the delicate structure of the 1998 Good Friday Agreement would already have been done by the implementation of the backstop. This is because regulations, previously within the disposal of the parties to the 1998 Good Friday Agreement within Northern Ireland, would be handed to agencies outside their control (see, for example, pages 425-435 of the Withdrawal Agreement). The startling effect of this would be that a Good Friday Agreement — created in 1998 to ensure bottom-up consent — would now be replaced by a top-down arrangement. The Agreement of 1998 was intended to bring to a close the ‘cold war’ between North and South. This it has done for many years. Unless we preserve its template, the current deterioration in North-South relationships might intensify in unpredictable and dangerous ways. In particular, the unionist population, which underwent an enormous internal struggle to accept the new North-South arrangements, is likely to regard itself as having been betrayed on the key point of compromise in 1998. It will increase their unwillingness to engage in further negotiations to lead to a return of devolution. The suspicion will be aroused among them that the Republic of Ireland will have, under the backstop, a greater directive power over Northern Ireland affairs. It will take politics in Northern Ireland beyond the legitimacy of the model agreed in 1998. Fortunately, there is a way out. The multi-party Good Friday Agreement of 1998 is supplemented by an international agreement between the UK government and the Republic of Ireland, the British-Irish Agreement of 1998, in which, in Article 2, the two governments affirm a ‘solemn commitment to support… the provisions of the Multi-Party Agreement’ (i.e. the Good Friday Agreement). This commitment, ‘in particular’, refers to the model for North-South cooperation so deeply altered by the backstop. For this reason, the UK government should say that it has, in international law, a legitimate expectation that these arrangements should be preserved; ‘pacta sunt servanda’ – agreements must be kept. In the interests of protecting the Good Friday Agreement, any backstop arrangements which might be agreed primarily to protect the economy of the Irish Republic in a context of crisis can only be temporary. In short, the obligations of the 1998 Good Friday Agreement — which the backstop claims to protect — require that it can only be a temporary arrangement and this must be put in explicit, legally binding terms. It is vital that the UK not allow the Republic of Ireland’s government to unilaterally escape its obligations under the 1998 Good Friday Agreement. It has done so in the past in relation to international treaties with very negative consequences. In 1925, Dublin recognised Northern Ireland as part of the United Kingdom in the Tripartite Treaty of that year. But in 1937, the Irish government repudiated this by making a territorial claim over Northern Ireland in its revised constitution. Three times during the Troubles, most notably in the Anglo-Irish Agreement of 1985, the British made massive concessions to secure something that in international law it already possessed. 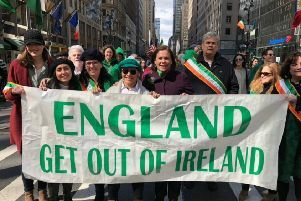 It is time to act now, so that the UK does not spend much of the next century, as it spent much of the last, playing a needless game of catch-up because it failed to insist that the Republic of Ireland should stand by its international treaty obligations. In 1998, a Fianna Fail Irish Taioseach Bertie Ahern saw the need for a genuine compromise and achieved an enduring place in history – securing Ireland’s most important interests along the way. It could be that a Fine Gael Taioseach, Leo Varadkar – himself something of a symbol of the new Irish Republic – may wish to emulate him over the coming days and weeks.